At least two people were killed by gunfire on Saturday, rights groups said, including a 14-year-old boy. 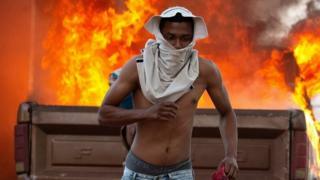 Venezuelan troops fired tear gas and rubber bullets at protesters attempting to collect and transport the aid. The opposition wants the aid to go to people hit by the economic crisis. Mr Maduro claims it is a security threat. US Secretary of State Mike Pompeo condemned the attacks on civilians, which he blamed on "Maduro's thugs". "Our deepest sympathies to the families of those who have died due to these criminal acts. We join their demand for justice," he said in a tweet following the clashes. Mr Pompeo also described the burning of some of the aid as "sickening". 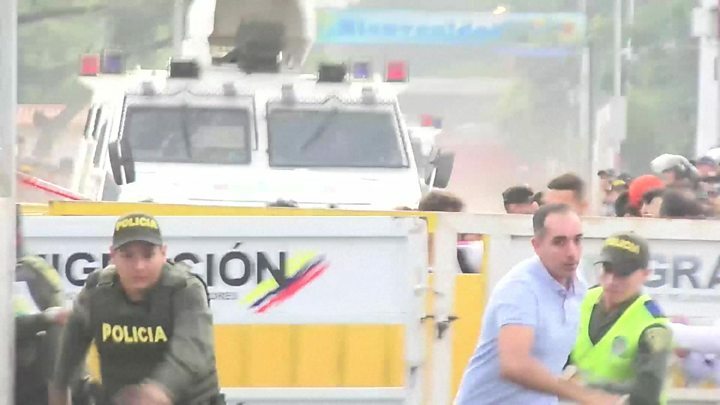 Opposition leader Juan Guaidó, who has declared himself interim president and helped to organise the aid, condemned the action by security forces. He is attending a meeting of the regional Lima Group, in spite of a travel ban imposed on him by Mr Maduro's government. 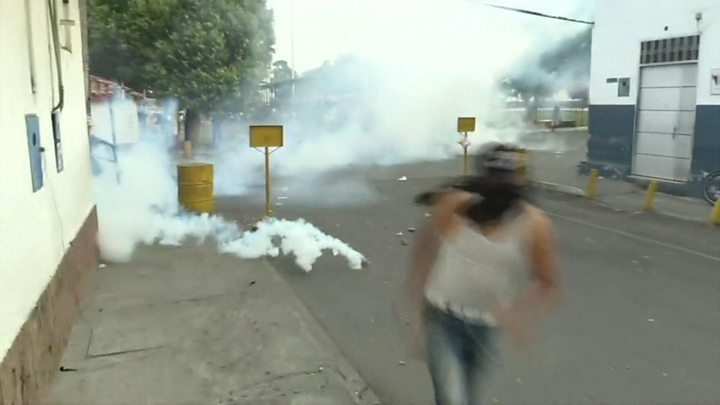 On Saturday evening, Mr Guaidó posted a tweet (in Spanish) which implored the international community to be "open to all options" in order to "liberate" Venezuela from Mr Maduro - who is continuing to resist all calls to stand down. Mr Guaidó organised the collection of hundreds of tonnes of foreign aid at the country's borders. He gave the government a deadline of Saturday to allow the aid to be brought into Venezuela or vowed to have volunteers march it in themselves. In response, President Maduro partly closed the country's borders with Brazil and Colombia, citing threats to security and sovereignty. On Saturday, Venezuelan civilians attempted to cross in order to get to the aid, which included food and medicine. Images from crossing points across the country showed security forces firing tear gas at volunteers. Protesters burned outposts and threw projectiles at soldiers and riot police. Rights groups say at least two people, including a 14-year-old boy, were shot dead in Saturday's clashes in Santa Elena de Uairen, near the country's border with Brazil. Another two were reported to have been killed on Friday. Amnesty International has described the use of firearms against protesters as a serious human rights violation and a crime under international law. There have also been reports of several aid trucks being burned - something Mr Guaidó said was a violation of the Geneva Convention. At about 19:00 local time (23:00 GMT) on Saturday, Colombia's government estimated the number injured at border crossings to be about 300. Journalists at the scene have reported severe injuries among protesters, including several who appeared to have lost their eyes. Mr Guaidó visited the Tienditas bridge on the Colombian side of the border, where he addressed soldiers abandoning their posts - promising them "amnesty" if they joined the "right side of history". At least 60 soldiers had defected by late Saturday, according to Colombia's migration service. But most of the military still appeared to be loyal to President Maduro. A video posted on social media appeared to show four soldiers publicly denouncing the president and announcing their support for Guaidó. "We are fathers and sons, we have had enough of so much uncertainty and injustice," the soldiers said. President Maduro continues to oppose Mr Guaidó's claim to the presidency and has ignored international calls to hold new elections. He has accused Mr Guaidó of being a "puppet", an "American pawn", a "clown" and an "imperialist beggar". 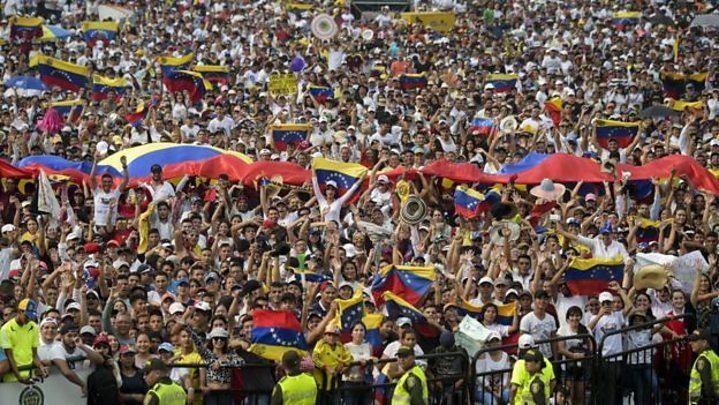 As protests got under way at Venezuela's borders, Mr Maduro staged a rally in Caracas. "Take your hands off Venezuela, Donald Trump," he told a cheering crowd, accusing the US president of using the aid as a means to invade the country. Mr Guaidó, who is the leader of the country's opposition-dominated National Assembly, last month declared himself the country's interim leader. He has called Mr Maduro's rule constitutionally illegitimate because of alleged irregularities with the 2018 general election. Mr Guaidó insists that citizens badly need help, while Mr Maduro views aid as a ploy by the US to invade the country. At least 2.7 million people have fled the country since 2015. Is aid a Trojan horse?